Three pilots of African (Black) descent, it was assumed that they came to Area 88 because the Central African conflicts pay so poorly. 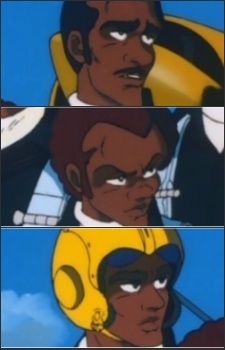 This trio of enigmatic pilots, seems to regard everyone at Area 88 with suspicion and keep to themselves. Shin, frustrated after a massive setback, plans to desert in the dead of morning only to encounter the three African pilots waiting for him. Mick appears, stating that he remembered stories about three Black pilots in Africa who specialize in hunting down deserters. Soon, the other Area 88 pilots defend Shin on the grounds that the Escape Killers are harassing an innocent person who could have just been taking an early morning walk. Saki and the other pilots convince the Escape Killers to leave. The Escape Killers were called Enforcers in the English translation of the manga. They also appeared in the OVA trilogy.